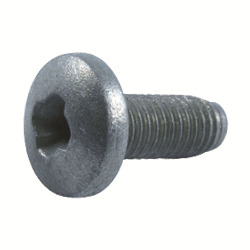 Hardened steel threadforming screw, with the correct size pilot hole these screws can tap their own thread into steel up to 10mm thick. Non-removable, one way Pozidrive system, Unique to Prolok – Design rights apply. Stocked in Galv., other coatings available by special order.